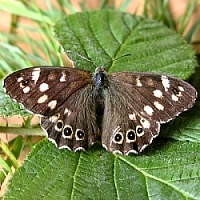 Habitat: The Speckled Wood is widespread and common in Ireland seen typically along woodland clearing, hedgerows and fields. This species is territorial and patrols a beat. 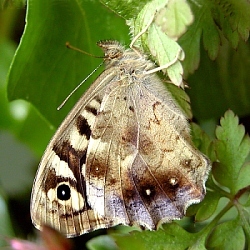 The male has a band of androconial scales on its forewing. Larva: On emerging, the larvae do not always eat the eggshell but remain close to it on the leaf. They feed inwards from the margins of the leaf to the midrib. The first brood larvae feed by day and night and are fully grown in 25-30 days when they enter pupation. hibernating and therefore can be found overwintering in either state. be as short as 10 days, but in the overwintering pupal stage it can last roughly from November to April. or adjacent vegetation. 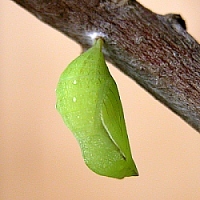 The cast larval skin is always attached to the pupa. take place from April onwards. 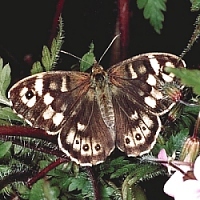 than the males althought there is a marked seasonal variation in bothe sexes. 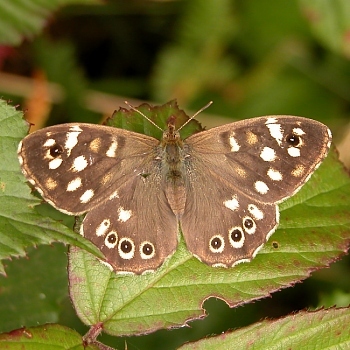 The oblique band of blackish androconial scales in the centre of the male forewings are difficult to see.